Who says you can’t have cake for breakfast? Or at any other time of day, for that matter? This healthy High Protein Berry Crumble looks and tastes like cake, but it actually has a great mix of protein and carbs, perfect for a healthy breakfast or snack. High protein berry crumble! I’m pretty sure no sweeter words have ever been spoken. You can eat this High Protein Berry Crumble for breakfast, dessert, or as a snack. Honestly, you could get away with eating it for lunch or dinner too… maybe with a few vegetables on the side to round out your meal. I’m not sure how great that would taste, but you get the point. This is a really healthy cake! I usually make my berry crumble with raspberries or mixed berries, but almost any type of berries will work. You can also use frozen berries, but you need to defrost them first. I always have a bag of berries in the freezer, so I can make this berry crumble whenever I have the munchies for something sweet and scrumptious, but still healthy. 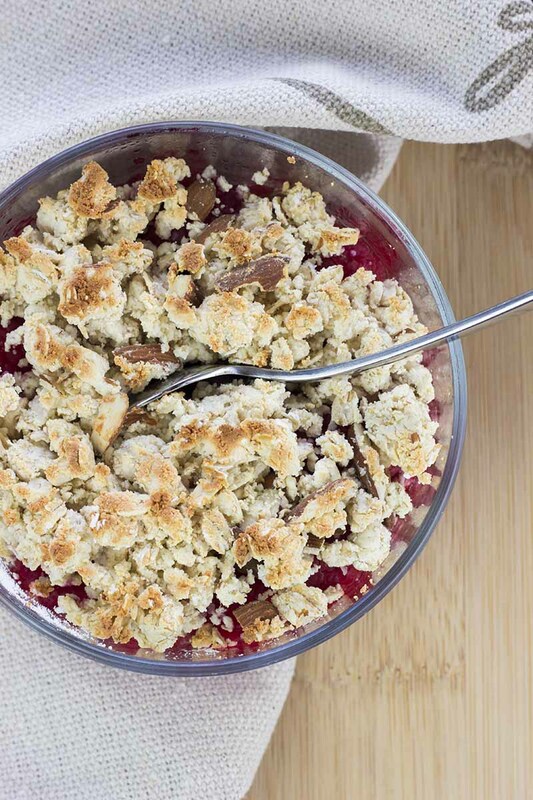 The trick to making this healthy crumble is to skip the sugar and use protein powder instead. I know this may sound strange, but protein powder is actually great for baking. It can add sweetness and flavor (and protein of course) without adding any extra sugar or carbs. Not all protein powders are good for cooking. I use Met-rx Vanilla Protein Powder because it keeps its consistency and flavor when heated. Honestly, I have served this High Protein Berry Crumble Oatmeal Cake for at least twenty people by now, and not one picked up that it was made with protein powder — none of them even suspected that it wasn’t a “normal” berry crumble. It tastes just perfect! If you don’t care about the macronutrients, you can leave out the protein powder and use a little oat flour instead. You can also make the recipe vegan by using a vegan protein powder instead. If you do take out the protein powder, add a little regular vanilla instead to get the flavor and sweetness back. 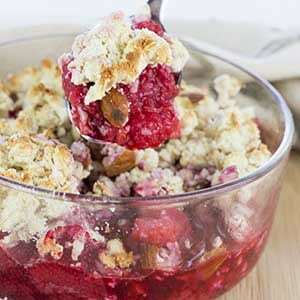 If you make berry crumble for a lot of people, make small or individual portions rather than one large crumble. 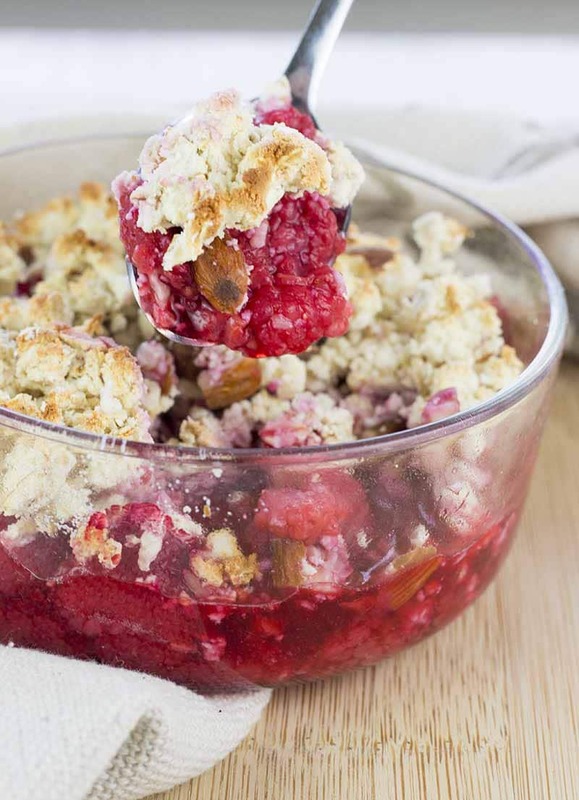 If you try to make a larger portion, the berries will be overcooked before the center of the crumble is done. You want the berries to stay firm and not cook into jam. One more thing I should mention is that this recipe is gluten-free. High protein, no added sugar, gluten-free… it’s pretty much the perfect recipe! You can see exactly how I put this tasty gluten-free crumble together in this video before reading the recipe below. I have also collected roundups of my favorite low-carb breakfast ideas for diabetics and easy diabetic desserts that you can check out for more recipe ideas! When you’ve tried this High Protein Berry Crumble, please don’t forget to let me know how you liked it and rate the recipe in the comments below! This high protein berry crumble looks and tastes like cake, but it actually has a great mix of protein and carbs, perfect for a healthy breakfast or snack. 2. Place berries in a small Pyrex oven dish and sprinkle a little Stevia on top. Mix protein powder, oats and lemon juice with a fork or spoon. It should end up as a fairly dry crumble. Chop the almonds into small pieces and mix them with the crumble. Spread the crumble on top of the berries. Bake for 15 min. Then set the oven to broil and bake the crumble for another 1-2 minutes until the top is slightly golden. 6. Take out of the oven and allow to cool a little before serving. Delicious and easy! Made with fresh strawberries. My husband and i were both impressed – and such great macros. Thank you!! I’ve made this twice now and it’s fantastic! Makes me happy having a dessert that is actually healthier than some other choices. Husband asked for it a second time so I knew he really liked it too. Thanks for sharing! This turned out delicious! I made it with the frozen 3-berry blend from Costco and Promix Unflavored Grass Fed Whey (just added a little vanilla extract). Note for people using other brands of protein – check out the nutrition for the linked Met-Rx because you may need more/less. My unflavored Promix called for 2 scoops to equal 1 of the Met-Rx used in the published recipe. Can you use peanut butter protein powder instead? Yes, but we can’t guarantee how it will taste 😀 It should taste good though, as peanut butter and berries is a great combination. If you make it, please let us know how it turned out. Just made this! Ended up splitting it into 2 smaller ramikins and topping it with some yasso cookies and cream ice cream. This is perfect! what size is that pyrex dish? It’s about 4.5×4.5 inches (11×11 centimeters). This looks so yummy!!! Thank you for sharing, would you know the nutrition info if I were to leave out the almonds? Thank you so much!!! Thank you! If you leave out the almonds, the nutrition will be 225 calories, 2 g fat, 27 g carbs, and 27 g protein. We use “old fashioned oats”. They are a little less processed than quick oats, but quick oats should work as well. How much ca you eat for 29 proteins? Thankyou for the awesome recipe! In the oven right now and I snuck a bite of the crumb topping before I popped it in the over and wow yum! I’m making it with quest vanilla protein. This is just what I needed tonight! And it fits nicely into my macros left for today. All around amazing in my book!